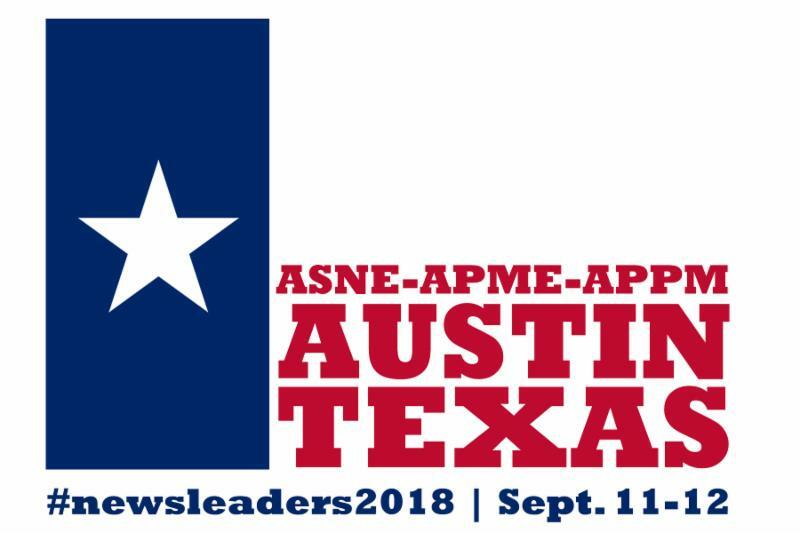 The 2018 ASNE-APME News Leadership Conference, filled with sessions to help you lead your newsroom, kicks off in less than two weeks. If you haven't registered yet, please do it now and make your travel plans. One added benefit of registering byFriday: You can bring a second person for just $100 more. Learn more below. See you soon at the AT&T Executive Education and Conference Center in Austin, Texas! We're going paperless this year. We will not have print copies of the conference schedule but no worries! We have an interactive schedule you can keep handy on your mobile device. Simply go to your browser and in the URL bar, type in http://asneapme2018.sched.com. We strongly encourage you to bookmark this page on your home screen and have it easily available. For directions on how to do this, click here if you are an iPhone user or here if you are an Android user. Those who register between now and Friday, Aug. 31, can bring a colleague for only $100. Email APME's Laura Sellers at lsellers.newstrain@gmail.com to receive a promo code for this deal. Special rates are also available for retired members, spouses, students and APME's Regents. Lunch tickets ($40 a piece) for Tuesday, Sept. 11, and Wednesday, Sept. 12, can be purchased during registration or separately from our online store. The Lenfest Institute for Journalism is pleased to support the ASNE-APME conference. The Lenfest Institute for Journalism is the first-of-its-kind nonprofit organization whose sole mission is to develop and support sustainable business models for great local journalism. Based in Philadelphia, the Institute is the parent organization of the Philadelphia Media Network, publisher of The Philadelphia Inquirer, Philadelphia Daily News and Philly.com. The Institute has awarded grants to organizations in Philadelphia and nationally to help develop new business models, audience engagement methods and news products that enable high-quality journalism. In its first cohort of grantees, the Institute supported Berkeleyside's direct public offering, the News Revenue Hub's Learning Lab, the Resolve Philly collaborative reporting initiative and more. It will announce a new open call for grant applications this fall. Together with the News Integrity Initiative, Democracy Fund and Knight Foundation, the Institute created the Community Listening and Engagement Fund, which provides subsidies for tools that help news organizations produce more relevant and trusted coverage for the diverse audiences they serve. Learn more about how to apply to CLEF here. The Institute also recently launched the Lenfest Local Lab, a new interdisciplinary team that will build and experiment with products that help citizens learn about and connect with their communities. It's testing location and interest-based products, along with new ways to enable citizens to connect with journalists and with one another. If you'd like to collaborate with the Lab, please email Sarah Schmalbach, the Lab's director, at sarah@lenfestinstitute.org. Solution Set is a weekly email newsletter report published by the Institute and the Solutions Journalism Network that each week covers one innovative idea in journalism and shares replicable lessons and best practices. You can read past reports or sign up here. For more information please visit www.lenfestinstitute.org or follow @lenfestinst. In recent years, the level of nastiness on comments on stories have left editors tormented about how to handle them, with some news organizations ditching comments from their site all together. But in the past year, as subscriptions became a more important part of the revenue stream, publishers found some interesting data. It turns out subscribers are far more likely to comment on articles or read the commentsthemselves, making them a critical selling and retention tool. And then a new open-source commenting system, funded by Knight Foundation, was released, decreasing costs for publishers and improving moderation. So where does that leave us now? Montgomery Advertiser: 8 years after Deepwater Horizon, beaches look good, but are they really? Des Moines Register: Mollie Tibbetts' death put a spotlight on undocumented immigrants. But can Iowa's economy thrive without them? The Tennessean: When we have mental health crises, are our schools, churches or doctors offices prepared? The Seattle Times: Did Seattle City Hall deliberately withhold records? New info shows tally of council votes before public meeting on head-tax repeal. AUSTIN, Texas (AP) — Austin American-Statesman Publisher Susie Biehle and Editor Debbie Hiott have announced that they are accepting buyout offers from owner GateHouse Media and will be leaving the paper. The announcement comes five months after GateHouse finalized its purchase of the paper from Cox Enterprises, which had owned the paper for 41 years. The American-Statesman recently extended voluntary buyout offers to all employees but hasn't revealed how many employees have accepted buyouts. GateHouse Media offered Columbia Daily Tribune employees voluntary severance packages Wednesday, Publisher Terri Leifeste said Thursday. Leifeste was unsure of the exact number of people who received the offers, but she said only those in production or sales were excluded. She emphasized that acceptance of the offers is voluntary. “It’s not a Columbia Daily Tribune initiative; it’s a GateHouse initiative,” Leifeste said. Tribune Managing Editor Charles Westmoreland said the paper’s plans had not changed since GateHouse Media’s decision to offer the severance packages. Supervising editor is Scott Swafford. Thomas L. Parsons, a newsman in the AP's Little Rock bureau for 27 years, died on August 18. He was 73. Parsons worked with the Pine Bluff (Arkansas) Commercial for 18 years and was managing editor when he left to join the AP in 1984. He retired in 2011. Chris Lehourites, who worked with him in Little Rock, recalled that "Tom was a great guy, very friendly and helpful to a young me when I got to Little Rock." "He had a passion for the English language and worked several years at the Pine Bluff Commercial, eventually becoming managing editor. He left in 1983 to work for the Associated Press as a newsman in their Little Rock bureau. Even if people remain unaware of it, many around the world have read words he wrote while there. "He loved spending time with his family, traveling, the outdoors, reading good books, music, and dinners out with friends and family." A gathering to remember his life is scheduled for Sept. 22nd at 6:30 p.m. at the Oyster Bar in Little Rock. In lieu of flowers, the family requests donations to Heifer International, https://www.heifer.org, a charity he believed in.